Bangladesh is the world’s leading exporter of raw jute and jute products, including carpet backing, twine and sacking. It accounts for as much as 24 percent of world jute production. Agriculture is the single most important sector of Bangladesh’s economy. 80% of the population is engaged in agriculture (66% of the labour force). Fifty-seven percent of the labour force is engaged in the crop sector which represents about 78% of the value added in the agricultural sector. The share of agriculture in GDP has fallen from around 57% in the 1970s to 35% in recent years but agriculture is still the largest economic sector. It is also the source of many of the small industrial sector’s raw materials, such as jute. The jute mills of the West Bengal recently cancelled import orders of as much as 2.5 lakh bales (1 bale=5 mounds) of raw jute from Bangladesh due to their prolonged labour strike and production suspension. The country is carrying over at least 15 lakh bale of raw jute to which, some 60 lakh bale is likely to be added this year, according to the government’s harvest projection. Although one of the world’s poorest and most densely populated countries, Bangladesh has made major strides to meet the food needs of its increasing population, through increased domestic production augmented by imports. Many economists believe the key to preservation of the viability of jute as an international commodity lies in maintaining price and supply stability. That has proved a difficult task. Of thirty major primary commodities traded internationally, only about six have as much price and supply instability as jute. Demand is highly sensitive to price increases, but not nearly as sensitive to decreases; once a portion of the market is lost to synthetics, it is very difficult to win it back through price competition. Introduction Jute dicotyledenous fiber-yielding plant of the genus Corchorus, order Tiliaceae. 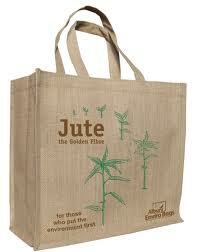 Jute was once known as the golden fibre of Bangladesh, since it was the most important cash crop for the country. Jute fibre is produced mainly from two commercially important species, namely White Jute (Corchours capsularis), and Tossa Jute (Corchorus olitorius). The centre of origin of white jute is said to be Indo-Burma including South China, and that of tossa Africa. Jute grows under wide variation of climatic conditions and stress of tropic and subtropics. It is grown in Bangladesh, India, Myanmar, Nepal, China, Taiwan, Thailand, Vietnam, Cambodia, Brazil and some other countries. Bangladesh used to enjoy almost a monopoly of this fiber commercially, its share in the export market was 80% in 1947-48 but in 1975-76 it fell to only 25%. The optimum range of temperature required is 18°-33°C. Jute is cultivated in the rainy season. In Bangladesh sowing usually starts at the end of February and continues up to the end of May, depending on the species This fall in the world market was due to the fact that many countries had started growing jute and allied fibers. The substitutes of jute are multiwalled paper bags, poly-propelin, polyethylene, and natural fibers from kenaf, hemp, sida, sunhemp, etc. Jute fibers are used in Hessians and gunnies, carpet and rugs, paper, canvas, tarpaulin, handicrafts, etc. Dundi (UK) purchases high class jute of all grades, particularly white tossa. Belgium, Italy, USA, South America are the buyers of superior quality jute. Jute and jute-based products are put to a wide range of uses. Since antiquity it has been used as a raw material for packaging. Before being used as a commercial commodity it was used in different parts of the world to make household and farm implements such as ropes, hand made clothes, wall hangings, etc. In Bengal sacks and saris made of jute were commonly used in the Middle Age. Export of sacks started in the 18th century. Its leaves and roots were used as herbal medicine, and as vegetable by the local people. Its use as an industrial commodity began in the Crimean war when it was used as a substitute of flax. Its use was popularised primarily in Western Europe, particularly at Dundee. Traditionally, use of jute products are limited to packaging materials like twine, hessian, gunny bag, twill, carpet backing, wool pack, tarpaulin, mats, canvas, wall cover, upholstery, and as furnishing fabrics of different types and natures. GDP is commonly used as an indicator of the economic health of a country, as well as to gauge a country’s standard of living. Critics of using GDP as an economic measure say the statistic does not take into account the underground economy – transactions that, for whatever reason, are not reported to the government. Others say that GDP is not intended to gauge material well-being, but serves as a measure of a nation’s productivity, which is unrelated. The gross domestic product (GDP) is the primary indicator used to gauge the health of a country’s economy. It represents the total dollar value of all goods and services produced over a specific time period – you can think of it as the size of the economy. Usually, GDP is expressed as a comparison to the previous quarter or year. For example, if the year-to-year GDP was up 3%, it means that the economy has grown by 3% over the last year. Measuring GDP is complicated (which is why we leave it to the economists), but at its most basic, the calculation can be done in one of two ways: either you add up what everybody earned in a year, or you add up what everybody spent. Logically, both measures should arrive at roughly the same total. A significant change in GDP, whether up or down, usually has a significant effect on the stock market. It’s not hard to understand why: a bad economy usually means lower profits for companies, which in turn means lower stock prices. Investors really worry about negative GDP growth, which is one of the factors economists use to determine if an economy is in a recession. Jute is called the golden fiber of Bangladesh. Jute grows well in tropical countries where there is much rain fall .Bangladesh is the only country where the best quality and much quantity of jute grows. She produces about 80% of the gross production of jute in the world. The fact that jute production is so labor intensive has played to Bangladesh’s strength, given the country’s large rural underemployment. Because wage rates in Bangladesh have been lower than in other jute-producing countries and because Bangladesh has the ideal growing conditions for jute, the country has benefited from encouraging its production even when world price and demand projections have offered bleak prospects. High as Bangladesh’s share of world trade has been–in 1985 it amounted to 77 percent of all raw jute trade and 45 percent of jute goods–there are realistic possibilities for expanding the share still further. The World Bank has estimated that Bangladesh’s share could rise to 84 percent for raw jute and 55 percent for manufactures. Jute production appeared in the late 1980s to be an essential part of the long-term development plan because, for all the troubles and struggles associated with its planting and marketing, no alternative activity offered any promise of being more profitable. Many economists believe the key to preservation of the viability of jute as an international commodity lies in maintaining price and supply stability. That has proved a difficult task. Of thirty major primary commodities traded internationally, only about six have as much price and supply instability as jute. Demand is highly sensitive to price increases, but not nearly as sensitive to decreases; once a portion of the market is lost to synthetics, it is very difficult to win it back through price competition. For example, in FY 1986 export sales remained low despite a 35-percent decline in export prices; the fall in world oil prices had also resulted in declines in the prices of polypropylene substitutes for jute as well, and most buyers that had switched to synthetics chose not to return to jute. In the late 1980s, there was nothing in the offing to arrest the trend of several decades of decreasing global demand for jute and declines in the value of jute relative to the goods Bangladesh must import to meet the basic needs of a desperately poor economy. Some hope for a better future has been placed in cooperation among jute-producing countries through the International Jute Organization, based in Dhaka. Member countries in 1988 were the producing countries of Bangladesh, Bhutan, China, India, Nepal, and Thailand and more than twenty consuming countries, including the United States.